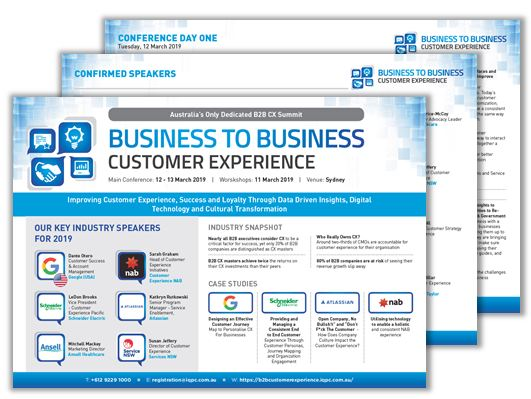 As the team behind Australia’s largest Customer Experience Management Summit, we have noticed that business to business customers are now demanding the same seamless and personalised experiences from their partners that they get with any B2C organisation. A study by Accenture found that 90% of B2B leaders believe CX is crucial to their companies’ strategic priorities but only 21% admit to having total control over the delivery of their CX. With that in mind, the summit has been developed to equip you with the knowledge to improve customer experience, success and loyalty through data driven insights, digital technology and cultural transformation, specifically for the B2B industry. Alternatively, request the agenda here.